Woods and Waters is committed to honoring the donations of all our landowners by protecting the natural areas they love. WWLT's first easement, encompassing 107 acres of forestland at the headwaters of the Cedar Creek watershed, shares a ½ mile boundary with Kleber Wildlife Management Area and is also part of a 4,000 acres of continuous forest. The land contains 19th century archeological sites, stone walls, the family graveyard, several seeps/springs, and a variety of forest types and conditions. It provides habitat for fox, weasel, coyote, bobcat, wild turkey, deer, and songbirds. Visiting the Caye property in April is inspiring: bluebells cover the creek bottoms; trout lily carpets the hillsides; and phacelia, waterleaf and Jacob’s Ladder bloom in abundance. What is also inspiring is Keith’s commitment to keeping his forest healthy. He actively removes pest plants. A conservation easement is his way of ensuring that his commitment to his sons, who share his love of the land, continues beyond his lifetime. Features: The diversity of the flora, especially the spring wildflowers, combined with the mature tree canopy, makes this property especially beautiful. 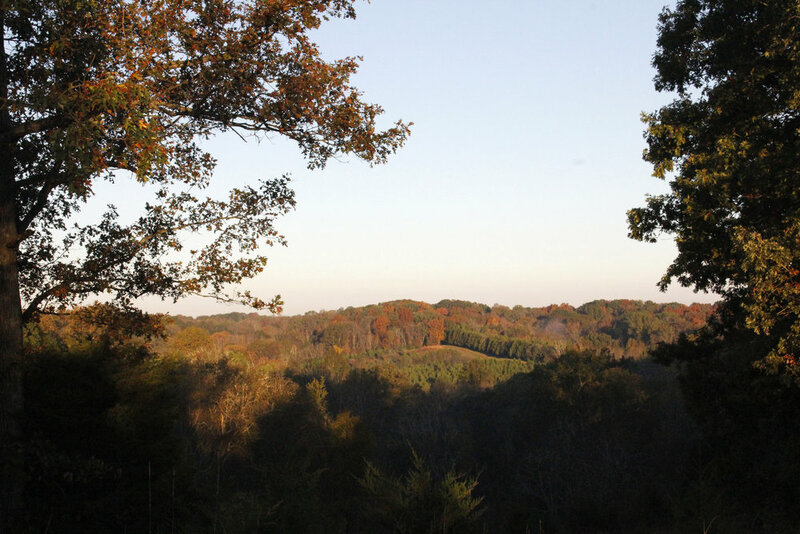 Features: Some of the oak trees on this Shelby County property are 7 and 8 feet across and, partnering with WWLT, they have protected this forest forever. Stream: 1800 feet of forested frontage on Benson Creek/ Kentucky River. Features: Wood’s bunchflower (Melanthium woodii), a state threatened plant occurs on the slopes of the stream, the upper reaches of Benson Creek. Gregory Woods was recognized as a significant natural area in 1986 by ecologists surveying the area. They noticed it was notably untouched, had remarkably old trees, and a rich diversity in the spring flora. Since that walk in 1986, the landowners in the area, the extended Schimmoeller family and other neighbors were inspired to buy this property when the surrounding uplands were being considered for development and logging. And in 2017, it was protected forever. Mature forest and the forest along both sides of Long Branch make this a wonderful natural area that contributes to the health of the region. This is a slide show of images taken by photographer and WWLT supporter, Ed Lawrence. All of these images were taken on WWLT protected properties in Henry, Owen, Franklin and Shelby counties. There is a several second pause between each slide.